Yet once I completed graduate school, another task that should have been impossible for someone who had lost their short-term memory due to the Lyme bacteria burrowing into my brain (or whatever it does, I’m not a neuroscientist), American Ninja Warrior appeared on par to me. Add to it that my dear husband supported me in this outrageous goal. Applying alone was a herculean task. There was a multipage written application with each page having 15-30 questions each. And then there was the video… I had absolutely no idea how to film and edit a video. But Jeff rose to the task and taught himself Adobe and put together an amazing video (which you can watch here). Keeping up my physical strength is huge part of my attempt to regain some sense of normalcy in my post-Lyme life. I rock climb, ride my horse, do this amazing thing called RedCord… but what I learned is in order to be a viable candidate, I had to step up my game. I added in Crossover Martial Arts, Kettlebells and NinjaKour. I treated this as a full time job. I wanted to do this for so many reasons. My original reason was because everyone told me I couldn’t. I wanted to show them all that I may have stumbled temporarily but that I was not staying down. 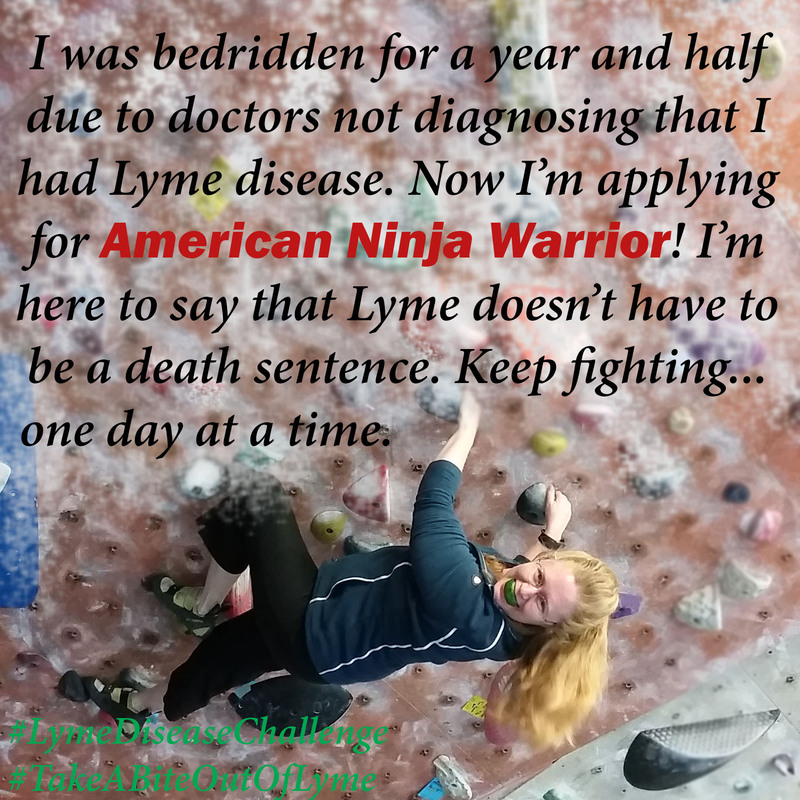 I also wanted to bring attention to the plight of the Chronic Lyme sufferer. Honestly, I originally treated it as a bit of a publicity stunt. But through this journey my motivation shifted- when I announced that I had actually submitted my application, I was flooded with messages of people telling me how I inspired them to keep going in their personal struggles. They said that seeing me fighting back helped them do the same- no matter what, even if it’s baby steps day to day, moment to moment. Then I realized that I wanted to get on the TV to show everyone that they too can keep fighting. Whether it’s Lyme, or depression, or cancer, or your spouse left you… all of these things are equally impactful and you too can keep going. No matter what happens on this journey, I have no regrets! Why ANW instead of another show? I suppose because I’m a fan of it. I don’t watch a ton of network television and ANW is one of the few shows I tune in to view.